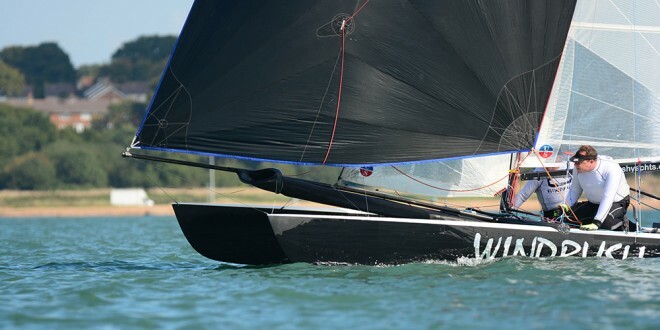 Over the weekend of the 26th and 27th September the Tornado Class held their national championships at Weston Sailing Club on Southampton Water. Most of the Tornado fleet arrived on Friday to get boats set up and secure a space in the field in between the other 75 catamarans attending the Cat Open. Saturday morning provided very light winds for the sailors. 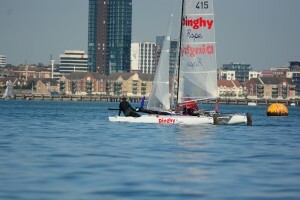 After the briefing the Tornados hit the water with their start scheduled first. Aaron Young and Rob Butterfield were lucky to be sailing after discovering their mast base had snapped off the front beam when they arrived on Friday evening. 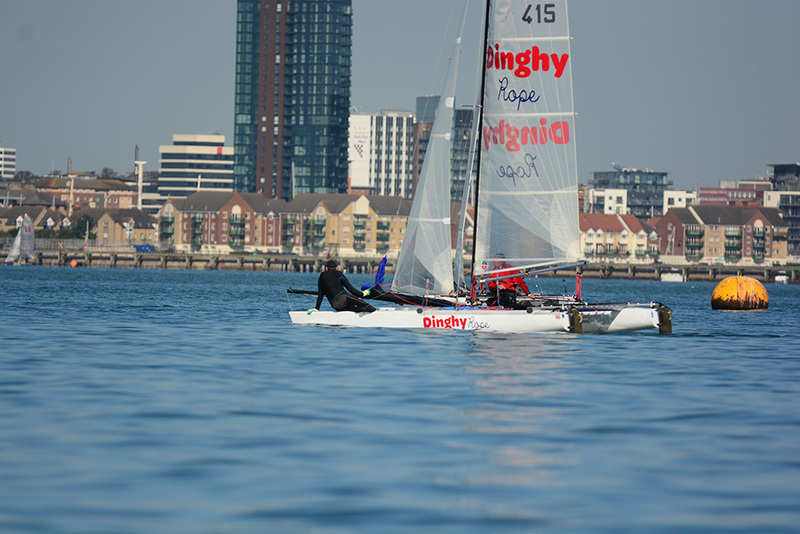 After a trip to Screwfix and a lot of drilling and banging on Saturday morning they managed to fit a new one and rig in time for the first race. Once on the water there was a postponement to start with while the wind picked up. The first race started in almost no wind, the fleet then got ¾ of the way up the course and the race was abandoned due to a shift in the wind. The wind then swung by 90 degrees so the race officer moved the course to a different area of the water. 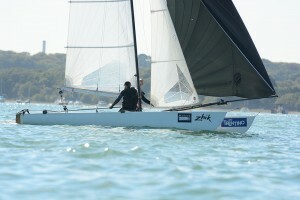 Once set up the race officer and his team had to abandon the next two start sequences due to wind shifts. Eventually the fleet started in a race which can only be explained as a lottery. It was the new Windrush Tornado sailed by Steve Glynn and Tom Duckmanton who came out on top followed by Aaron and Rob then and Tom and Seb. The race officer called it a day after one race with a fading wind and tide restrictions. With the sunshine out it was only natural for the sailors to head for a cold beer and to enjoy the sunshine. Later on in the evening the club put on a BBQ followed by the rugby and a band. On Sunday we had an earlier start with 4 races scheduled to try and catch up with the missed races from Saturday. The breeze was better but with a mind on getting all of the races in the race team scheduled 2 laps for the first 3 races of the day. Although there was more wind there was a definite advantage of going to the right hand side of the course and taking a deeper tack into the windward mark. Close to the windward mark there was a nasty shift which meant having to put another tack in if you were too close. The racing throughout the day was very tight across the fleet with one mistake meaning a move from hero to zero. It was Aaron and Rob who took the first two victories of the day moving them into top spot. Tom Gall and Seb Samways took the victory in the last two races leaving it very close at the top. Further down the fleet it was also close with plenty of place swapping across the races. Kevin and Andrew Dowley sailing their Dinghy Rope Tornado took 4th place on count back ahead of Matthew Amiss and Sam Woods. Overall a fantastic, friendly weekend of racing in tricky conditions with plenty of boats to avoid across the course with the other fleets. Each of the Tornado sailors also picked up some items of Zhik sailing clothing which was kindly donated by Zhik as part of their sponsorship of the event. A very big thank you to Weston Sailing Club for their hospitality. The race officer and his team did a fantastic job with the various fleets and over 80 boats. In 2016 the UK Tornado Class will be heading back to Stokes Bay to join in with their catamaran open in September.